As Thanksgiving weekend looms ever closer, it’s time to start thinking of holiday traditions both new and old, and making plans for this holiday season. 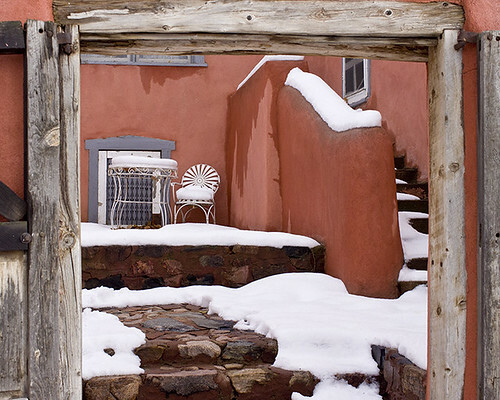 If you haven’t been to Santa Fe during the holiday season before, then we can’t think of a better time to start. Santa Fe during the holiday months is a truly magical place to visit, and features a calendar chocked full of memorable traditions and other festivities to enjoy while here. Throughout the months of November and December, there is no shortage of festive fun to be had in Santa Fe, and El Farolito Bed and Breakfast is the perfect place to call home while you’re here. Our luxurious accommodations will help you feel relaxed and at home, while all of Santa Fe’s culture and holiday traditions are at your fingertips. Book your room with us today, and start planning your perfect Santa Fe holiday. Imagine the Santa Fe holiday scene, where the traditional adobe architecture and glowing faralitos are set against a backdrop of brilliant blue skies and snow-capped mountains and trees. Of course we can’t forget that floating through the air is the uniquely sharp scent of burning Piñon wood. Santa Fe celebrates the holidays unlike any other major city in the US, with its unique combination of Spanish, Native American, and Old West influences. On November 23rd, enjoy the traditional Santa Fe holiday favorite, Handels Messiah at the Lensic. Then, on November 28th, head down to the Santa Fe Plaza, where you’ll enjoy the annual Christmas tree lighting and the official kickoff to this year’s Santa Fe holiday season. If you’re looking for unique holiday gifts, then don’t miss the annual Santa Fe Indian Market, or the many boutiques and galleries that are teeming with special gifts. Santa Fe’s annual Christmas at the Palace is on December 12th, followed by Los Posados on December 14th. Los Posados is a wonderful holiday tradition in Santa Fe, where a candlelit procession travels around the Plaza recreating Mary and Joseph’s search for a place to give birth to the Baby Jesus. Christmas Eve in Santa Fe is nothing short of a magical winter wonderland, when the Santa Fe Plaza is filled with 1,000 glittering farolitos. People gather around bonfires, sing carols, drink cider, and celebrate another holiday season. 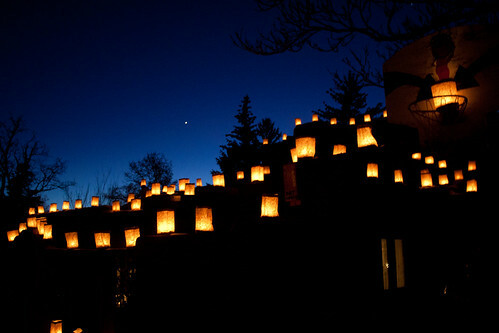 No conversation about the Santa Fe holiday traditionas would be complete without mention of the annual Canyon Road Farolito Walk. On this special night, Canyon road is lined with farolitos, exceptional works of art are displayed inside the century-old adobes along the way, guests enjoy the sweet taste of hot chocolate & biscochitos, and are warmed by bonfires. Whether you’ve experienced a Santa Fe holiday before or not, now is the perfect time to book you room at our centrally located Bed and Breakfast, and to start planning your holiday adventure.